Arisi Vella puttu or Sweet rice puttu is a traditional dish made during Navratri especially on Navratri fridays. I was getting lot of requests for this recipe, so I prepared it today. Today we will learn how to make Arisi Puttu (Navaratri special) following this easy recipe with step wise pictures. Wash and soak rice for 1 hour. Drain the water completely and spread it on a cloth. After an hour, fry the rice on low heat until it turns golden brown as seen in the picture below. Allow it to cool. Powder the rice slightly coarse. You will not get fine powder but slightly coarse. This is the arisi puttu flour. Add boiling water little at a time to the rice flour. The flour should be slightly moist. That's all. If you take a little flour and press it, it should hold its shape (picture below) and when pressed again slightly it should easily crumble. That is the right consistency. Now steam the flour for 15 minutes loosely tied in a cloth or just press it between your fist and steam as I have done it. You can use the steamer or an idli cooker. Once steamed, transfer the flour to a plate. Let it cool a little. Using your fingers break all the lumps. An easier method is to grind it in a mixie just for a second to crumble the dough evenly. Make sure that there are no lumps. Now we will prepare the jaggery syrup - Add just enough water to the jaggery and boil it. Filter it to remove the impurities. Then boil again until it reaches a hard ball consistency. What is hard ball consistency? When you drop a tsp of jaggery syrup in a cup of water, it should not dissolve. You should be able to collect it and make a slightly hard ball from it. At this stage, remove the jaggery syrup from heat. Add the jaggery syrup to the steamed puttu little at a time and mix it well. 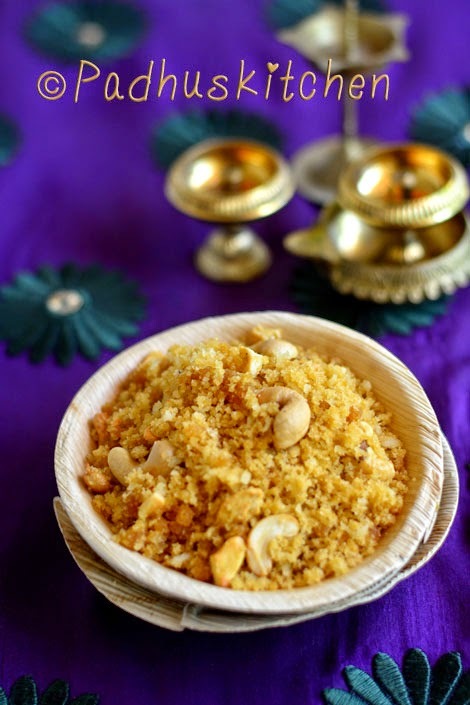 Heat 2 tsp of ghee and fry cashew nuts and grated coconut separately and add to the puttu. Add cardamom powder and mix it well. Delicious Arisi vella puttu is ready for Neivedhyam. Apart from making sundals during Navratri, you can prepare this delicious puttu on one of the 9 days during Navratri. I am sure you will love my Kerala Puttu Recipe and Ragi Sweet Puttu Recipe. Padhu will never go wrong. It came out very well. You are giving even very very small details.That makes your recipe perfect and tasty.